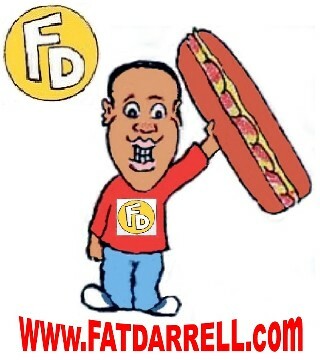 All that and a bag of chips… – #DoubleFML FatDarrellPalooza! So, I just realized that I may have had pizza for dinner 4 of last 7 days! I suppose my use of the words “may have” is somewhat misleading. It was definitely 4 times. …okay fine, it was actually 5. Granted, I was the first one to immediately like the comment but either way, a promise is a promise, eh?! I don’t actually use that phrase in real life anymore. Unlike poor Congresswoman Annie Kuster who’s still shamelessly “raising the roof” here in 2019! Anyway, here I sit, pizza slice in hand, scrolling through all the photos I’ve taken since last post. Needless to say, I’ve been pretty busy lately so, there’s a lot! These first few photos are from The Atlanta Hawks Pop-up event on 404 Day! “What’s 404 Day” you ask? Well, 404 is the original area code here in Atlanta so April 4th (aka 4/04, get it?) is a day when the city gives itself a giant pat on the back through events and celebrations. We set up shop in the heart of the Georgia State University campus with free food, music, games and prizes! It was a great time. I know that Detroit also holds a 313 Day on March 13th so I’m sure other cities do this as well. Unfortunately my hometown will never be one of them since July 32nd doesn’t exist. Bummer. Next up are a few pics of Live Nation / House of Blues venues I’ve done stagehand production work for since my announcement last post. 3 weeks in and I’m happy to report that I haven’t broken anything or anyone….yet. I know, I’m just as surprised as you are! Unfortunately The Hawks didn’t make the playoffs this year so we had our final game on the 10th. It was an emotional time after the game since it was the last of the season so there were lots of tears and plenty of photos! Before the game, I also got to participate in the unveiling and ribbon cutting ceremony for Tiny Doors ATL’s new art instillation at State Farm Arena! Tiny Doors ATL is the brainchild of fellow Rutgers University alumnus Karen Anderson and is causing quite the buzz in The ATL! In fact, when I was taking photos of the piece, several local students excitedly told me all about the Tiny Doors movement and how they learned about it at school. Congratulations Karen and GO RU! For more information about Tiny Doors ATL, check out their website by clicking here! Last but not least was the Sharecare Heartbeat Festival and 3 on 3 Tournament at Central Park (Atlanta not that “other” Central Park…)! There were games, prizes, food vendors and more! Of course, you know I was repping The Flight Crew bringing the energy and fun to the event! The Atlanta Hawks Dancers even put on a clinic teaching everyone how to do Lil Nas X’s Old Town Road dance! Our breakers, stunt team, mascot and several players were also in the house! NBA Legend Dominique Wilkins and current Hawks superstar Jason Collins also joined in the fun! And you know I couldn’t let this opportunity to pose with the Chik-Fil-a “cow army” pass me by! Although the NBA season is over, I’ll still be representing The Hawks at several events throughout the summer. In the meantime, I still have my gigs at Mercedes Benz Stadium and Live Nation plus acting, music and writing gigs to keep me busy. Anyway, speaking of Live Nation, during a split shift last week, I went looking for snacks. That part of the story is no surprise, but what I found is. Behold! Those are 2 of the 4 summer remixed potato chip flavors from Frito Lays. Specifically, the Wavy Electric Lime Sea Salt and Flaming Hot Dill Pickle flavors! I’ve been looking for these for over a month! I’d originally planned to feature these back in February but gave up after 6 failed attempts at finding them in stores. It wasn’t until now that I randomly stumbled upon them at Walgreens of all places! I thought they were full size bags though so perhaps I overlooked them. These tiny 2.75 ounce bags each cost $1.89! …and you know the bag was half full of air! Not to sound like a grampa but “back in my day”, you could get a full size bag for that kind of cash, ya whippersnappers! Perhaps the extra cost goes toward the free Bebe Rexha song available for streaming with each purchase. You can also enter to win concert tickets and other prizes as well! I’ll get that later though, for now, let’s see how they taste, shall we? Let’s save the best for last and start with the Wavy Electric Lime and Sea Salt! The Verdict: Guess what?! They taste like …potato chips with lime and sea salt. No surprises there but that doesn’t mean they’re boring by any means. I’m not sure whether it’s the chips or the fact that I haven’t had a proper vacation in over a year, but the taste transported me to a tropical island somewhere with my feet in the sand. As for the Bebe Rexha song that accompanies this flavor, it’s the Pop Remix to Right Here Right Now. It’s catchy and fits the vibe of the chips. You can also listen as many times as you’d like but for some strange reason, you can’t leave the web page to let it play in the background or else the music pauses. No multitasking here, Bebe requires your undivided attention apparently! While we’re here though, let’s see if I won concert tickets! But you can check back everyday if you’d like, so I suppose there’s that. Anyway, let’s try the Flaming Hot Dill Pickle Remix flavor, shall we? The Verdict: Oh yeah! Hot, tangy, I like th ….WHOA! Okay, they weren’t kidding when they said “flaming hot”! I didn’t’ expect that second kick! I personally still like them, but they’re definitely not for everyone. My next trip to “the potty” may be quite the adventure as well because if they burned my throat going down, they’re definitely going to burn on the way back out! Okay, this one is the Hip-Hop Remix to Right Here Right Now featuring Saweetie. It has a nice bounce to it and also fits the attitude of the flavor. The additional bass also makes it easier to cover the sound of your stomach bubbling with gas after eating these chips so well played Frito Lays! Well played… thankfully I don’t have company. As for the contest, I’m 0-2 but like I said, you can check every day if your heart desires. There are also 2 other remixes and flavors to try..if you can find them! There’s the Classic Beer and Cheese flavor that includes a Classic Rock Remix to…you guessed it! Right Here Right Now. And there’s a Bacon Wrapped Jalapeno Popper Duet flavor that comes with a Country Remix. I’m not as interested in that particular remix but the flavor sounds delicious! The website also has exclusive behind the scenes video content from Bebe Rexha, so if you’re a fan, you’re going to love this promotion! It’s actually a pretty brilliant marketing concept and a fun experience overall. Music, chips and some light gambling. It’s like a night in Vegas for less than $2 bucks! What more can you ask for? Do you have another food item, restaurant or recipe we should all try? Tell us in the comments below! Obviously, regular potato chips aren’t the healthiest choice, so I was planning to also feature these House Recipe Sweet Potato Chips from Gusto! They’re delicious and literally contain only 3 ingredients: Sweet Potatoes, Sunflower Oil and Sea Salt. If you’ve been paying attention to my fitness tips throughout the years, you’ll know how great that is! The less ingredients, the better so these get an A+ grade since they’re also delicious. So, we have several takeaways already. Look for healthy alternatives to your favorite snacks, make sure they have minimal processed ingredients and always check the back of the label. However, I have an additional fitness tip inspired by these chips. If you zoom into the photo and look closely, you may have already figured it out. You see, I focused so much on the back of the bag, that I completely ignored the front. Specifically the part where this bag expired last month! They were giving them away at Mercedes Benz Stadium during one of the Atlanta United matches and since I’m shamelessly greedy, I grabbed about 30 of them! I’d been pacing myself thinking they’d be good for awhile but I found myself feeling sick the other day and couldn’t figure out what I’d eaten…until now. So please learn from my mistake and don’t be like Darrell in this case! While I still say you can usually ignore the advertising on the front of the label and the back is where your focus should be, you’ll definitely want to check the expiration date too! Before we go, let’s check out the latest batch of foodie holidays! Strange week, although the jelly beans make sense. That reminds me, if you celebrate, I hope you all have a wonderful Easter with your family and friends! Speaking of which, I’m deeply saddened seeing the iconic Notre Dame Cathedral destroyed by fire. I’ve yet to visit Paris so I never got to see it in person before this tragic event. Yet another reminder how short life is. Travel while you can! In brighter news though, it was great to see Tiger Woods back on top of the golf world after so many had written him off. After the personal scandals and multiple surgeries, he ranked as low as 1000th in the world last year and look at him now! It just shows that no matter the odds, always believe in yourself and never give up. Anyway, that about does it for this week folks. Please leave a comment below before you go! Also feel free to continue the conversation on our social media pages by clicking the logos on the main menu. Let’s make it a great week people! Those were both surreal moments. I’m hoping they can restore Notre Dame but it’ll never be the same. As for Tiger, I’m not a huge golf fan but that was an amazing story! Never give up! Ha, not sure I measure up quite well, he’s REALLY tall and I’m REALLy short! lol it was great to meet him though! 404 Day was fun! If you’re in the area next year, it’s definitely worth checking out! Wow! Those strange chips are out-of-sight! Thanks for the taste test. I don’t think I will try these because I don’t want to have to take take Gas-X!!!.. LOL The winner for me are those sweet potato chips because I love anything sweet potato. Thanks for your reminder to check expiration dates before eating foods.!!! The sweet potato chips are great! But yes, double check that expiration date first! I did not like those chips…..now I’d be on board with a pork roll and cheese flavored bag of chips though. On to another thing….it being Easter and the season for Peeps. I am not a fan but…the husband picked up the maple syrup ones. They are quite yummy. I just found the bacon wrapped ones so I’ll give my thoughts on them soon! I didn’t mind these but wow, your pork roll and cheese flavor sounds like a great idea too!! As for the peeps, our “For the Peeps” post has a taste test of the pancake flavored ones. I haven’t tried maple syrup yet but I’d imagine it’s similar. Hmm, maybe I’ll give them a shot based on your recommendation!